The Old Shale pattern, nowadays better known as Feather and Fan, is a famous and well-known old Shetland pattern with deep scallops. It comes in many variations and one can play around a lot with it. 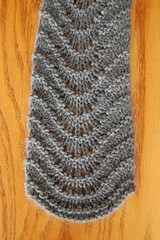 I have used this Feather and Fan pattern as a base in several of my designs and I simply love how easy it is. Repeat row 1 to row 4. See how nicely it scallops? I love it. Don’t ask my why. It just does that. At first I had no problems with that. I have made many scarves like this and it didn’t bother me at all. Nowadays, it does bother me. I don’t find these aesthetics pleasing anymore and I want both ends of my scarf looking exactly the same! For the Feather and Fan scarf I am working on right now, I am using two different balls of yarn: Lace Merino Silk by Karabella, and Kidsilk Haze by Rowan. 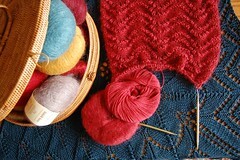 For needles, I am using 24″ circular Addi Turbo Lace Needles. They are less slippery than the regular addis, and I love how the ends are so pointy. Perfect for lace! 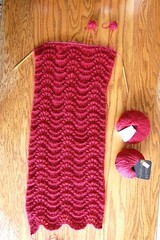 The Feather and Fan shawl that I am working on right now has more scallops. I casted on those 18 stitches, with multiple of 3. So this means 18×3=54 stitches. I also throw 2 more side stitches in the mix so all in all, at the start of this pattern I will instruct to cast on 56 stitches. And besides that, I am altering the traditional Feather and Fan pattern a tad little bit, but I will talk about that in my next post. I specifically want the two sides of my scarf to look exactly the same. 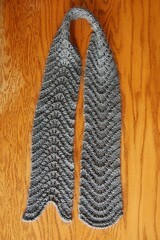 After I finish my second half, I will join the two pieces together using a technique called “three needle bind off”. In my next blog post, I will show you how to do that. Thanks so much for reading and until the next entry! 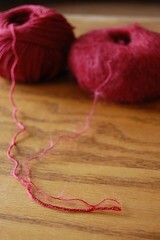 This entry was posted on Tuesday, March 30th, 2010 at 8:29 pm and is filed under Knitting. You can follow any responses to this entry through the RSS 2.0 feed. Both comments and pings are currently closed. 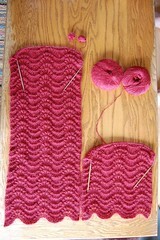 I’m going to be watching this closely as I refuse to join a scarf in the middle using Kitchner. 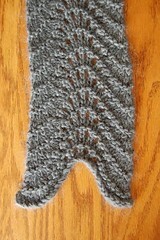 If 3 needle bind off works I’ll be knitting many Fan and Feather scarves. I am curious, though, about what will happen in the middle with that lovely scallop working against itself: will it flatten out (probably) or ??? I made this scarf before, and the very first time I made it, yes, I left it up to fate. Low and behold, it worked out to my satisfaction and I was happy with the result. The trick is to know where to stop in your pieces. You know that purl ridge in the Feather and Fan? After that purl ridge (which is a knit row on the ws) you go ahead and do two more rows of St st.
Do exactly the same with the second piece. And now you have two pieces that are to be joined in where st st is happening and on either side it will have that scalloping purl ridge. I am happy with that easthethics. I tried the kitchener stitch at first and it TOTALLY MADE ME BONKERS! I screamed out of frustration while doing it and then finally found solace in the three needle bind off technique. 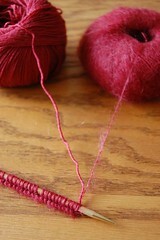 I have come to the realization that kitchener stitch works for a small amount of stitches. Like for to close up a toe of a sock. I did that once and it worked.